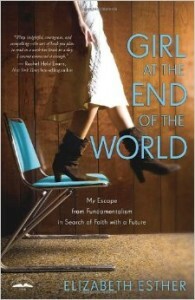 I just read an excellent book, Girl at the End of the World: My Escape from Fundamentalism in Search of Faith with a Future, by Elizabeth Esther. This isn’t going to be a complete book review, but I’d like to make a few comments about why this is such an important book. A religious group or organization which calls itself Christian but does not hold to the major tenets of the Christian faith, especially a triune God and salvation by faith. That’s just from my memory of our exploration back in the 1970s. And by that definition, we assured ourselves we were not a cult. But I would return to that definition many times in the coming decades as I looked back at those formative years and began to believe that we were a cult. When I would say that I had been part of a cult for many years, some people who had been on the same journey with me would disagree, pointing out that we never left the true religious definition of a Christian group. And that is true. It wasn’t our beliefs that caused our sickness. It was our behavior. What I remember most are the increasingly strict rules and the insular, fundamentalist traditions we developed…. Women were required to dress very modestly and behave within strict gender roles. Everything, from how we ordered our daily schedules to our tone of voice, was monitored…. That is why, when people ask me why I call The Assembly a cult, I say it’s because we operated like one. Cults aren’t so much about beliefs as they are about methods and behavior. According to cult researchers, it is the emotional seizing of people’s trust, thoughts, and choices that identifies a cult. I cried as I read Elizabeth’s descriptions of the tyranny under which she lived for so many years. The seizing of people’s trust, thoughts, and choices. And although her situation was stricter and more oppressive than mine, there were many similarities, if not the specifics, the general issue of emotional control. And control over every aspect of our lives. At one point all the women in our group were required to have grocery-shopping partners, so that we wouldn’t be tempted by the world when we went out shopping. We would always have someone to check us. I was often “in trouble” with the group for my free spirit and behavior. I was called out for the way I dressed, for acting independently of my husband, and at one point I was criticized for hiring a maid to help me with housekeeping, an action which was termed “snobby” and “elitist.” I was the first parent to send a child to 4-year-old preschool, which was met with harsh criticism. Although our group did send our children to a public school, evidently it was considered unnecessary and harmful to send them before age 5. A wise kindergarten teacher called me in for a meeting one day about problems one of my children was having, and she encouraged me to let this child make some friends outside of our church group. She said we were so insular that the children being raised in the group treated each other like siblings—and in my child’s case there was bullying because of too much familiarity. I’m not going to give more specifics from my own experience or from Elizabeth Esther’s book here. But if you have concerns that you are now or have ever been part of a cult, please read her book. And—spoiler alert—I hope you will find encouragement, as I did, that after she left the cult, she didn’t leave God. She and her family became Catholic. She still loves God, even after everything she suffered as a child and young adult in The Assembly. Me? Today I still believe. I’ve had some dark years, and even recently some dark weeks and days. But I’m thankful for the ways that God seems to continue to seek me out. Like He did last Friday during one of the Holy Friday services at St. John Orthodox Church. When the choir led us in the hauntingly beautiful chant, “The dead shall arise!”something in my soul shifted. I found myself weeping as I sang along during this service of Lamentations for Christ’s crucifixion, death, burial and the beginning of a hope for His resurrection… and mine. I was standing next to one of my Goddaughters, and I turned to her and said, “I believe this is real.” And she knew what I meant. It wasn’t just an emotional response to the music, but it was an emotional response to the music. One thing I love about the Orthodox faith is the way it embraces all our senses—smell, sight, sound, touch… and yes, even our emotions. Am I thankful for my journey to Orthodoxy? No. If I had it to do over again, I would RUN away as fast as I could from the cult I gave those seventeen years to. The cult I raised my children in. But it was my journey, and through it—maybe in spite of it—Jesus still chased after me. And that’s just one more thing I love/hate about living in the Christ-haunted South.